When the first Hallmark Resort opened, the owners lived onsite with their dog Sissy. Because they believed pets to be part of the family, they extended the policy to all guests — becoming one of the first dog-friendly hotels on the Oregon coast. Today a portion of the rooms are pet-friendly. 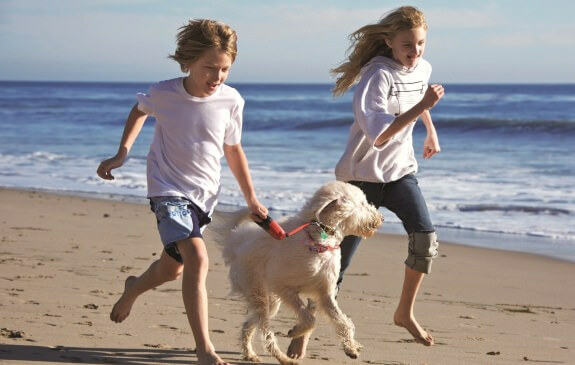 Four-legged guests receive special “doggie bags” with their own sheet and towel for wiping off sandy paws, a custom water bottle and bowl for trips to the beach, a Frisbee throw toy, pooper scoopers, and doggie cookies. If miles of pristine beach aren’t enough, both resorts have two pet exercise areas, complete wash-down stations and treats available 24-7. The pet stay fee is $20 per pet, per night. Hallmark Resorts donates a portion of our pet fees to local shelters. In 2015, we donated $10,000 to the Lincoln County Animal Shelter in Newport and the Clatsop County Animal Shelter in Cannon Beach. The humane societies provide care and protection to hundreds of homeless, abandoned and abused or neglected dogs and cats in their respective areas. “We see how our customers care for their pets when they stay with us. Unfortunately not every animal receives this kind of support, so we make this gesture on behalf of those who value their pets as members of their family,” said Kirby Blankenship, Vice President, Director of Operations for Hallmark Resorts. Please be responsible for your pet. Pets cannot be left unattended in guestrooms or on balconies. Pets left alone in strange places may not behave normally. Barking, and or room damage may occur. Guests leaving pets unattended are subject to a $150 at Hallmark Resort Newport and a $250 fee at Hallmark Resort & Spa Cannon Beach.